Posted on September 26, 2018 by Carrie Gress. Both radical feminism and homosexuality have no use for healthy, ordered, loving men and women, parents, and children. What, then, were the errors of Russia that she was referring to? Most of us think of Russian errors largely as communist and Marxist ideologies. This is generally correct, as Marxism is behind most of the ideologies we face today either openly or surreptitiously. But could there be more to it than just that? Something deeper than Marx and crew? Posted on September 10, 2018 by Carrie Gress. It has been 50 years. That’s how long ago the Sexual Revolution took the West by storm. This year brought another revolution: the #MeToo movement, which exposed some ugly facts. Sexual assault and harassment are far more widespread than we’d admitted. But are these two realities unconnected? Or did the first storm lead to the second? Posted on June 5, 2018 by Carrie Gress. These three small words were like a switch, moving me from my interior Martha, to whom Christ says, “Martha, Martha, you are anxious and worried about many things,” to becoming more like Mary, who chose just to focus her thoughts on Christ. Of her, Our Lord says, “Mary has chosen the better part” (Luke 10:41-42). Posted on May 29, 2018 by Carrie Gress. I just don’t feel a connection with Mary.” I have heard this over and over again from women, particularly in the last year since the release of my book The Marian Option. “Yes, I understand,” is always my response. For years and years, this is exactly how I felt. Posted on May 22, 2018 by Carrie Gress. What would happen if parents helped their children to go directly to Mary and forge their own relationship with her? Probably something pretty remarkable. Posted on February 26, 2018 by Carrie Gress. The last 50 years have been hard on men and even harder on the idea of masculinity. One group of guys have decided to do something dramatic for themselves and for other men to reclaim their call as sons, brothers, husbands and fathers. I spoke with Sheila Liaugminas on her show A Closer Look about Feminism and femininity, the ‘poisoned ideology of feminist ideology’, and how we can do better talking about woman’s identity. Posted on February 10, 2018 by Carrie Gress. 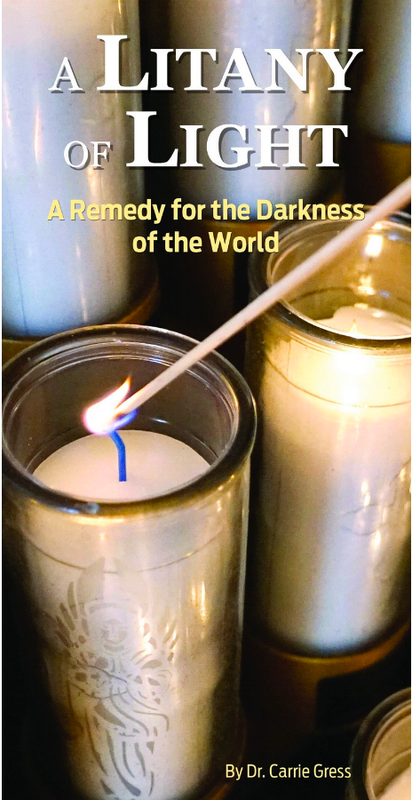 The Marian Option: God's Solution to a Civilization in Crisis has been awarded a Silver Medal in the 2018 Illumination Awards, which are given to books published with a Christian worldview. Posted on January 24, 2018 by Carrie Gress. Joseph Dinesh at Song on Fire Ministries, based in India, interviewed me about why Catholics are leaving the Church and what can be done to help them return. Posted on January 19, 2018 by Carrie Gress.